In the summer of 2014, some 100,000 Christians fled their ancestral homelands in Mosul and the Nineveh Plain to escape genocide at the hands of the Islamic State, fleeing to the Kurdistan region in the north. Numerous families have since migrated to Western countries, while others sought refuge in Lebanon, mostly hoping for Western settlement. Families still remain in exile in Kurdistan, and some have returned to the liberated areas. Before 2003, there were about 2 million Christians in Iraq. As a result of waves of conflict and persecution, now they number around 250,000. Yet “there is real hope that Iraq could be reborn after so many years of turmoil,” says His Beatitude Ignace Joseph III Younan, the patriarch of Antioch and All the East for Syriac Catholics since 2009. He made a pre-Easter apostolic visit to the country. From the patriarchate in Beirut, Lebanon, the patriarch shared with the Register about that visit. What were some of the highlights of your visit to Iraq? Can you share your impressions? This five-day visit was indeed one of the most uplifting visits I made to Iraq for the past nine years. 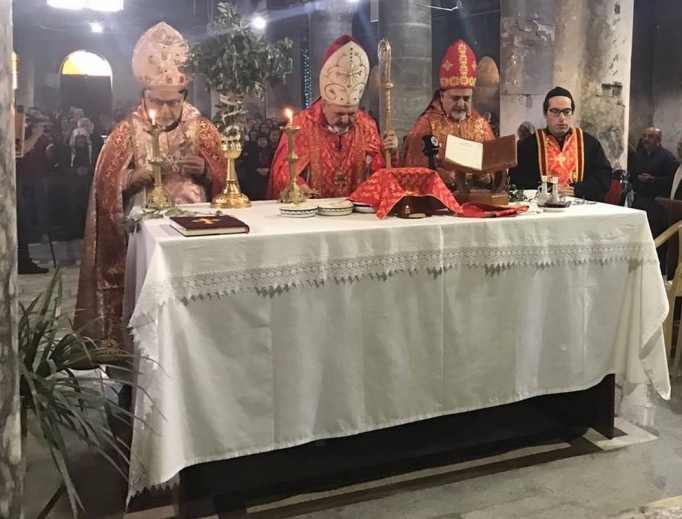 Beginning in Baghdad, I celebrated Friday evening (March 23) the Divine Liturgy of the Mass, followed by the Stations of the Cross at our Cathedral of Our Lady of Deliverance, the one that offered 46 martyrs slaughtered by Islamic terrorists back in October 2010. In a remarkable ecumenical celebration in the presence of the Chaldean patriarch, the apostolic nuncio and other Catholic and Orthodox hierarchs, we offered prayers for the intention of two medical doctors, a husband and wife, as well as the latter’s elderly mother. All three were slaughtered at home the week before in a Baghdad quarter, where Christians used to be a significant number but at the present time are reduced to a very tiny minority. The cathedral was packed with faithful coming, from nearby and far away, who needed buses provided by the church for transportation. The following day, we took the morning flight to Erbil, where we celebrated the Palm Sunday vigil at the Queen of Peace Church that was mostly attended by refugees from Mosul and the Plain of Nineveh. In the homily I thanked the Lord for the liberation of the cities and villages that were invaded in 2014 by the so-called Daesh (the Arabic acronym for the Islamic State) and expressed hope that all of those expelled and uprooted will find the way of return to rebuild and live in security, either in Mosul or in the Plain of Nineveh. We headed that Saturday evening to Qaraqosh, the largest Christian city of Iraq. On Palm Sunday we celebrated the Divine Liturgy early in the morning at the Cathedral of the Immaculate Conception, still blackened by the arson of the terrorists. More than 2,000 people filled this church, which is the largest church in Iraq, built by the parishioners in the 1930s. The homily was a hymn of thanksgiving, praise and hope! At 9:30 that morning, the palm procession began with a crowd of many thousands. It was a thrilling procession throughout a reborn city that a year ago was like a ghost city. Because of security, photographers were not allowed to cover the procession from the sky, in order to count the multitude of participants at that procession. The crowd was comprised mostly of those people who returned to Qaraqosh. According to Archbishop [of Mosul] Boutros Moushè, around 5,000 Syriac Catholic families did return home. Some 1,200 families still remain in exile in Kurdistan [in northern Iraq]. The same evening, I held the rite of the naheereh (lanterns) at St. John the Baptist, the second-largest church of Qaraqosh. In this devotional celebration, the Syriac Church recalls the Parable of the 10 Virgins of the Gospel (John 25:1-13) expecting the coming of the Groom, as a preparation for the Holy Week. Monday the 26th, we made a visit to Mosul and toured what was left of the churches in the ancient city that was the last spot to be liberated from Daesh and therefore was more than 90% destroyed. We were told that, till a couple of days before that, military forces were recovering cadavers under the ruins! How sad to see those ancient churches: two Syriac Catholic churches — the Cathedral of the Virgin Immaculate and St. Thomas Church — with a school; two Syriac Orthodox churches — the Virgin Mary Cathedral and St. Thomas Church — with a school and a seminary; the Chaldean churches of Our Lady of Perpetual Help and St. George’s, both with schools and the Armenian Orthodox cathedral. Also the St. John’s Seminary of the Dominican Fathers, which was known for its clock tower. All [have been] heavily damaged or turned into ruins! That same Monday we visited our monastery of Sts. Behnam and his sister Sarah, 15 miles southeast of Mosul, which was retaken by our Ephremite monks. The tomb of the patron saint, which is the oldest site, dating back to the fourth century, was blown up, but, fortunately, it was rebuilt with the supervision of some archeologists. The manuscript collection was also saved because the monks hid them between two walls. Before returning to Ankawa, Kurdistan, Monday evening, we prayed the vespers and celebrated the Divine Liturgy in Bartella at St. George’s parish hall, because the church was still undergoing reconstruction work. What is your assessment of the areas that were liberated from the Islamic State, particularly regarding security, reconstruction efforts and the return of Christians? I was really wondering how the reconstruction works were progressing in Qaraqosh, the largest city of the Plain of Nineveh, from where all of its Christians were uprooted — some 50,000 people. The repairs in the dwellings, churches, hospitals, businesses and schools, as well in the infrastructures were going amazingly fast. You would see some blackened buildings, but, overall, there was work going on, and people were mostly happy. In my opinion, this is demonstrated by the will of Christian people to return, stay and rebuild, despite all obstacles and threats. As for security, there is a combined governmental police force, mostly made of Christian police recruits, either at the entries or on the streets. In your conversations with the faithful, what are their concerns? They need safety in a way so as not to be forced into exile like in the past. Many of them talk about the need of a self-administration, mostly in security and education matters, within a unified Iraq run by a central government. What realistically can be accomplished in Iraq, in your opinion? What is needed from the Iraqi government and the international community? There is still a lot to do in order to re-establish a safe and prosperous Iraq. The central government of Baghdad has to understand that Christian citizens are the indigenous segment of the population. They are not imported people, and they do not want to be considered “minorities” in the pejorative meaning, with no fair representation in government and being deprived of their civil rights, because of having a religion different from that of the majority. The international community, particularly the U.S.A. and the Western countries, has to remember that Christians are threatened because of their faith. Christians do not need foreign protection from outside countries. Their main and just demand is to live safely and in a dignified way in their own land. For such, the central Iraqi government has to be pressured to grant all the citizens the same civil rights, without any distinction of religion, ethnicity or language. How do you see the hope of the Resurrection for the beleaguered Christians in Iraq? There is real hope that Iraq could be reborn after so many years of turmoil. Iraqi Christians have suffered a lot during the past three generations or so. They deserve to live in liberty and dignity of equal citizenship. For that, they rely on the countries that have a say on the international scene, in order to experience the peace of their Resurrected Lord and God, Jesus. How do you view the level of aid coming from the U.S. government to Christians and other minorities in Iraq, particularly after U.S. Vice President Mike Pence announced in October 2017 that the United States would bypass the United Nations and provide support directly to persecuted communities through USAID? What is needed? We have been promised by the U.S. vice president that future financial help would be channeled through the heads of churches who are best knowledgeable of the needs of their beleaguered flock. But as I came to know, unfortunately, this did not happen until now! However, on the other hand, Catholic organizations, such as the Knights of Columbus, Catholic Near East Welfare Association, Aid to Church in Need and Catholic Relief Services, are helping the local Churches in Iraq and Syria, as well as our patriarchate in Lebanon, to assist the Iraqi and Syrian refugees for their basic needs and the education of the children. We are extremely thankful for their effective solidarity and contribution into various rebuilding projects, particularly in the Plain of Nineveh. Here in Lebanon, our goal is to help our refugees have their basic needs met with human dignity, with the hope they will find ways to go back to their homeland and are not crossing seas and oceans for good! How can Catholics in the West help? First, to extend a charitable hand for those who have abandoned everything because they are uprooted from their homeland; second, to exercise pressure on their government and elected people in order to remind them of the values and principles on which the U.S.A. was founded. The so-called New World was a land of opportunity. It should not turn into a land of opportunism!